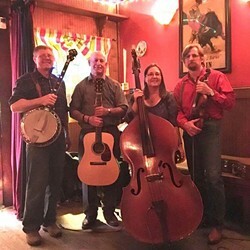 This group has high energy, foot stomping tunes, and slow, end of a long lonely day tunes too. Three part harmony is at the core of what they do best, fast or slow. The band includes Dave Cobb on guitar and vocals, Mary DeBerry on bass and vocals, Terry Ghee on fiddle, and Steve Nash on banjo.